It was an ugly win, but a win nonetheless. 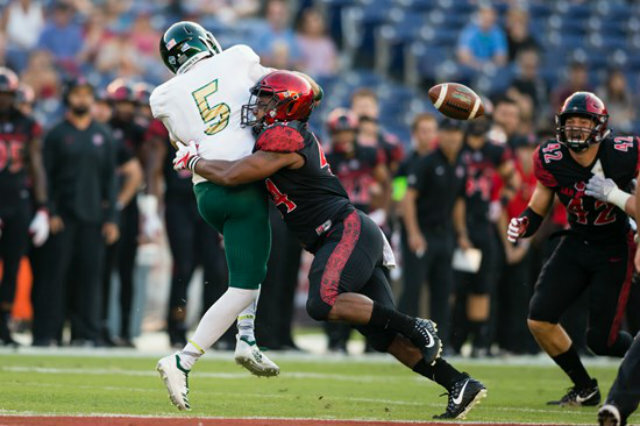 After losing starting quarterback Christian Chapman to a knee injury, the Aztecs rallied back in the fourth quarter for a 28-14 win in the home opener. The matchup against Sacramento State (1-1) was supposed to be easier than the season opener against No. 10 Stanford. It was anything but. Chapman, who completed 6-of-11 passes for 112 yards, was forced to leave the game with 4:47 left in the second quarter. The senior quarterback was hit below the waist by Hornets defensive end David Perales following an incomplete pass intended for wideout Tim Wilson. Champman was writhing in pain following the hit and Wilson was flagged with a personal foul. The preliminary diagnosis was a left knee sprain, though doctors won’t know for sure until tests are completed on Sunday. Backup Ryan Agnew was forced to take over for the rest of the game. He recorded a career-high 159 yards on 11-for-17 passing. And he did exactly that in the fourth quarter when SDSU was down 14-13. Agnew led San Diego State (1-1) on a 13-play, 82-yard scoring drive starting at the 9:18 mark that ended a Juwan Washington four-yard rush into the end zone. Agnew then hit junior tight end Parker Houston for a two-point conversion that gave the Aztecs the lead for the rest of the game. Washington posted a career-high three touchdowns on personal-best 36 carries for 156 yards. Two of Washington’s touchdowns were posted in the final four minutes of the game. Following the sacking of Hornets quarterback Kevin Thomson by Kyahva Tezino on a 4th-and-3 situation with less than three minutes left in the game, Washington’s 20-yard touchdown rush up the middle put the game out of reach. San Diego State next hosts Arizona State at home.